The Paso Robles Opportunity Zone is unique to others found in California in that it encompasses the entire downtown area as well as surrounding residential neighborhoods. Opportunities for investment include vacant parcels, multifamily residential properties with deferred maintenance, commercial/office buildings in need of façade and interior improvements, and a number of businesses that could thrive with additional capital from private investors. An Opportunity Zone is located within an economically-distressed area where new investment, under certain conditions, may be eligible for preferential tax treatment. 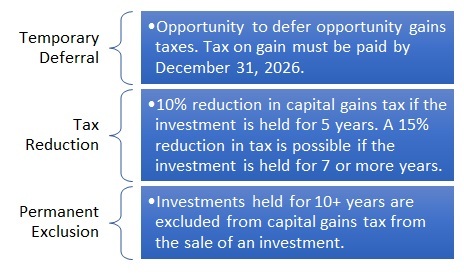 Investments in these zones through special funds called Opportunity Funds will be allowed to defer or eliminate federal taxes on capital gains earned from the sale of stock, business assets, or property. The Paso Robles Opportunity Zone includes all land within the City boundary that is west of the Salinas River and north of 1st Street.